Dudley is no ordinary dump truck! He joins his friends Dexter the Digger and Mix ‘n’ Fix Mike down on the building site! Like all WOW toys, Dudley the Dump Truck is completely battery-free and works with a robust friction motor that even has the realistic sound of an engine. Dudley is one of WOW's most popular toys - includes a driver figure called Marky, three traffic cones and two barrels for loading and tipping. A simple rotating switch on the side of Dudley enables kids to operate the tipping mechanism and dump the load wherever they want - and hear the tipping sound as well. The windscreen opens for easy access to the driving cab, and Dudley the Dump Truck also incorporates a carrying handle for quick transport from room to room. Suitable for ages 1½ to 5 years old, Dudley the Dump Truck helps kids develop their motor skills as well as engaging in important and friendly role play. 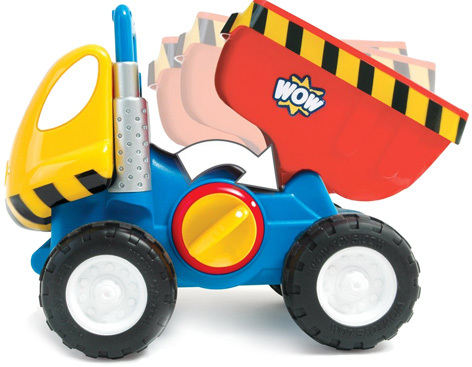 Please tell us what you think of Dudley Dump Truck by WOW Toys.